Victoria Osteen has gained recognition and respect as a co-pastor of the world famous Lakewood Church together with her husband and best-selling author, Joel Osteen. Her message of faith and love targeted towards women and children have gained her respect and a loyal following of her own. In Victoria Osteen's new storybook series, she takes her readers on exhuberant fantasy adventures that encourage children to use their imaginations to grow in their faith and inspiration. In this tale on the high-seas, two friends, "Captain" Jon and his "First Mate" Sue, embark on an adventure of imaganation and discovery. While exploring the world on their imaginary ship, they meet a grumpy old pirate who is looking for the ultimate treasure. Told with a yo-ho-ho and with sing-songy rhymes, these two adventurous friends teach the old pirate that the best treasure of all is the love in our hearts. A fun activity and crafts page at the end of the book encourages kids to implement the lesson they've just learned and to the adventure in their own daily lives. - Publisher Victoria Osteen has gained recognition and respect as a co-pastor of the world famous Lakewood Church together with her husband and best-selling author, Joel Osteen. Her message of faith and love targeted towards women and children have gained her respect and a loyal following of her own. In Victoria Osteen's new storybook series, she takes her readers on exhuberant fantasy adventures that encourage children to use their imaginations to grow in their faith and inspiration. In this tale on the high-seas, two friends, "Captain" Jon and his "First Mate" Sue, embark on an adventure of imagination and discovery. 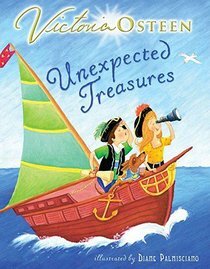 While exploring the world on their imaginary ship, they rescue a couple of grumpy pirates whose boat has crashed while sailing after the ultimate treasure. Told with yo-ho-ho, sing-songy rhymes, these two adventurous friends teach the pirates that the best treasure of all is the love in our hearts. A fun treasure map and answer-aloud question section at the end of the story encouage parents and children to talk about the lessons they've just learned and to discover the adventure in their own daily lives. Victoria Osteen has gained recognition and respect as a co-pastor of the world famous Lakewood Church together with her husband and best-selling author, Joel Osteen. Her message of faith and love targeted towards women and children have gained her respect and a loyal following of her own. Victoria Osteen has always had an infectious passion and enthusiasm for life. A native Houstonian, Victoria began her career in her family's jewelry business and now works with the most precious treasure of all -- people. She is an inspiration and mentor to women everywhere as she ministers alongside her husband, Joel, and sets a wonderful example for their two children, Jonathan and Alexandra. Victoria is active in her community and committed to helping women, children, and families discover their purpose and reach their highest potential. ýVisit the Osteen website at www.joelosteen.com.